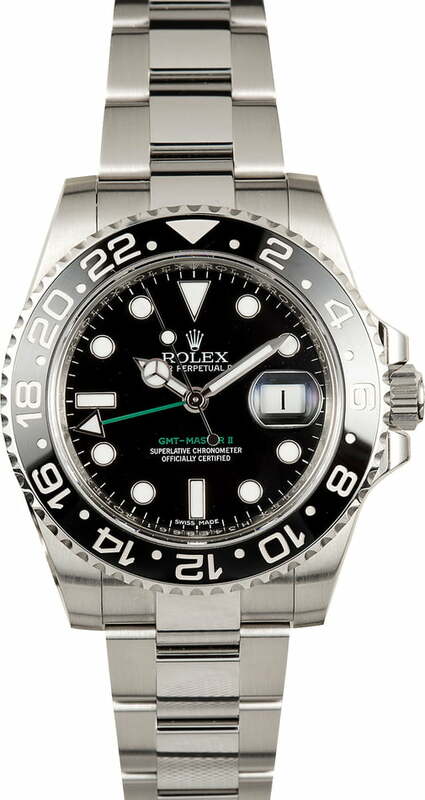 The GMT Master II came to market in the early 1980s, bringing with it an independent 24-hour hand on the dial. This upgrade allows the wearer to adjust the 24-hour without disturbing the current time, thus increasing the number of time zones that the wearer can read simultaneously to three. While it was initially developed as a pilot's watch, the GMT Master II has since found an impressive following among men and women of all professions and lifestyles. 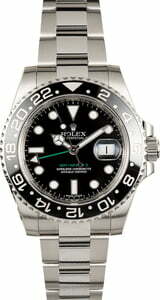 The preowned Rolex 116710 came to market in 2007 during a time when Rolex was rolling out new case and bracelet designs. While the case maintains a classic 40mm diameter it now weights slightly larger on the wrist, thanks to the addition of fatter lugs, a larger crown guard, and a new-style Oyster bracelet with a solid Oysterlock clasp. The case is also outfitted with the highly coveted ceramic Cerachrom bezel and a modern maxi dial with larger hour markers and hands.